For the listener, the real question is 'Are the styles of these three men identifiable in the song compositions?' Generally, the answer is positive, but it is better on some songs than others. Those songs are 'Running In The Wind,' 'Schizophrenic Disorder,' and the immensely enjoyable 'G String Song.' I would consider all three the best songs on the disc if it were not for 'Remember Blues.' Being a major blues fan, I found this the most dynamic piece on the album. However, though the trio is great, it's really keyboard player Alessandro Del Vecchio who outshines them all. Kudos should also be given for the skill and originality on 'Besides Nowhere, the histrionic jamming on 'Double D,' and the destined to be a crowd-pleaser, 'Go Down Peter,' a terrific spin on the Peter Gunn theme. 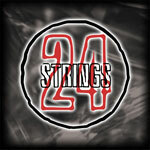 24 Strings is an excellent and creative spin on the whole guitar instrumental album. Caruso, Xotta, and Ferro know how to rip it up, keep you entertained, and more importantly work together under one well-deserved spotlight. Good stuff!